Enjoy Sushi Go Round at Home! 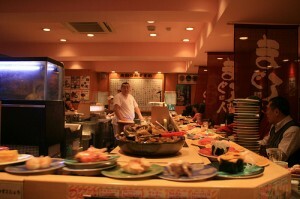 For those who want to enjoy sushi go round at home, there are some table sized ones!! “Tetsudo Restaurant and Game -Shinkansen N700” is a Shinkansen (Japanese bullet train) style sushi go round toy for children. You can control the train by a remote control. In the video, they put fake sushi on the train but you can put rolls, hand roll sushi or whatever you want on it. The good thing about this toy is that you can arrange the rail, so if you have long table you can just make straight one way railroad (that’ll be no more sushi go “round” though). “Sushi Shokunin -Kaiten Sushi” is more like a miniature version of actual sushi go round counter. It’s small and cute but you can definitely get the feel of sushi go round! These toys might be good peg for kids to make their own food. They will love to make sushi rolls if they have fun.